This hardware pack is included with the ELEV-8 v3 Quadcopter Kit, and we offer it here as a convenient source of spare parts for repair and customization. It contains all of the screws, nuts, aluminum standoffs, and spacers needed for assembly (note that Saddle Washers are not included, but are available in their own pack). Where steel is used, we've specified 18-8 stainless steel for added strength and resistance to corrosion. See the Details tab below for a complete parts list, and the Additional Resources tab for links to the ELEV-8 v3 Quadcopter Assembly Guide and the labeled reference photo used therein. NOTE: This hardware pack is not compatible with the ELEV-8 V2 Quadcopter Kit. 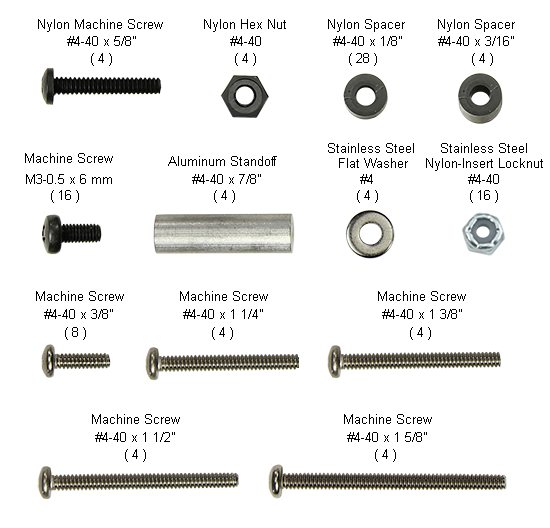 (4) Nylon Machine Screw, #4-40 x 5/8"
(28) Nylon Spacer, #4-40 x 1/8"
(4) Nylon Spacer, #4-40 x 3/16"
(4) Aluminum Standoff, #4-40 x 7/8"
(4) Machine Screw, #4-40 x 1 1/4"
(4) Machine Screw, #4-40 x 1 3/8"
(4) Machine Screw, #4-40 x 1 1/2"
(4) Machine Screw, #4-40 x 1 5/8"
NOTE: Items not available individually. Parts and quantities subject to change without notice.